Quesachilada are a Mexican inspired concoction I cam up with this winter. 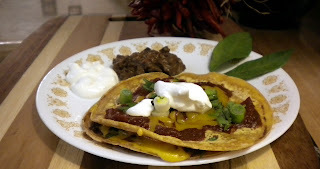 We had leftover enchilada makings but we were really in the mood for some easy to make quesadillas, so I thought lets church up some easy quesadillas into something special! I whipped these together and they were a fun snack that I feel would be super popular amongst the younger crowd out there. Enjoy! Mix together the onions, Serrano and jalapeno in a small bowl. Separate the mixture into four even piles. Spread out 3 tortillas on a baking sheet and separate the beans equally between them. Spread the beans over the tortillas with a spoon. Sprinkle one pile of the onion mixture over the beans on each tortilla, saving the last pile of onion mixture. Divide the cheese into four piles, Sprinkle each of the three tortillas with 1 pile of cheese, saving the last pile. Place the three remaining tortillas over each Quesachilada and place baking sheet into the ovens middle rack. Back for 15-20 minutes and then remove from the oven. Drizzle the enchilada sauce over the Quesachiladas, sprinkle the remaining cheese and onion mixture over them and place back in the oven until the cheese is fully melted and bubble. Remove from the oven top with sour cream and serve hot with your choice of sides, enjoy!